Great Britain was perhaps the last of the significant western powers to embrace classical architecture. Yet, by the mid-18th century, Britain had become Europe’s most committed and dogmatic classicist. Indeed, the country came arguably to lead the way for most of that century in what was later to culminate in the neo-classical movement across the continent. To understand how this transformation was possible, one name is inescapable: Inigo Jones. To understand how Jones became so revolutionary, two things should serve to illustrate the case. Firstly, British architecture in the 16th century was insulated and relatively conservative. Before Jones came on the scene in the early 17th century, British architects still built castle-like structures, onto which classical elements were added for the most part as features of exotic décor. At the beginning of the 16th century, France had led the way in this trend of importing classical novelties like pilasters by tacking them onto essentially medieval structures. Britain initially followed suit. Yet when France moved on to a more mature national classicism by the mid-century, Britain stayed the original course, and continued do so throughout the century, and initially into the next. Inigo Jones was the first English architect to bypass the influence of these two countries entirely and go straight to the source of contemporary classicism: Italy. The result was a giant leapfrog, but it also undermined the national vernacular. Secondly, Jones was important in another respect, which made his significance not simply exclusive to the trajectory of British architecture, but which potentially sowed the first buds of neo-classicism. He found himself at odds not only with French and Dutch deviations from the classical model, but also with that of contemporary Italy itself. He expressly condemned the innovations of Michelangelo, and approved only of the works of Palladio that conformed or seemed to conform to ancient Roman models. He, thus, introduced a puritan version of classicism, which had room for modern innovation, but which put a premium on recreating the spirit of Roman works. The most reliable guide to Roman building in Jones’ time was the Four Books of architecture by Andrea Palladio. Jones may also have had opportunity to study Roman ruins directly during his tour of Italy. The link to Palladio is important and has always been recognized as such. When the example of Jones re-emerged in the shape of the Burlington school in the 18th century, the subsequent style came to be known as English Palladianism. Indeed, when we look at the original plans for Jones’ chief design, The Banqueting House, we find that he proceeded from a Palladian model. The building is two-storied, the windows are capped by pediments, triangular and segmental, and the design of the elevation is separated by simple verticals and horizontals: pilasters or half-columns and entablatures. In the original drawings, the elevations look as if copied directly from Palladio’s book. They feature a central pediment, of a kind that Palladio often used. However, the decision of Jones to break the entablature and push it forward above the columns seems to have convinced him that the central pediment had to go. The top of the building that was actually built was, therefore, crowned with a flat balustrade instead, and the sloping roof was thus hidden. In the old designs, you can even see where Jones had started to fill in the breaks under the central pediment. But his lines are feint as if wavering, as if he had seen in the process of sketching that the combination would not work very well. The swags in the top-storey also make an entry at this point. The result is a work where all the elements are borrowed from Palladio, but the manner in which they are assembled can be said to be original. The original windows were mullioned, not sash, and the building was later refaced with Portland stone. The original provision had called for Portland, but for some reason Jones had to make do with lesser types of stone. Apart from that though, the building stands as it did during Jones’ time. Whether Jones intended the hall as part of a larger palace to be extended later is not clear. 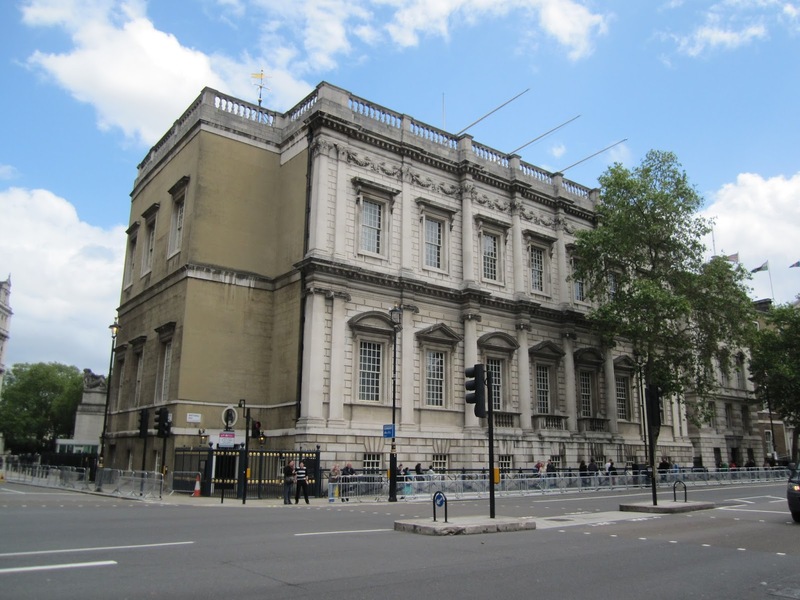 Later drawings of a very large Whitehall palace have been attributed to Jones. In addition, the sides of the building reveal exposed brickwork, possibly done intentionally with a view to expand the structure. In any case, the impact on British architecture was immense, though a modified vernacular tradition continued to thrive for most of the century. The most important English architect of all time, Christopher Wren, was not averse to borrowing elements from modern baroque architecture, from both France and the Netherlands. However he seems to have borrowed a preference for the Roman from Inigo Jones. 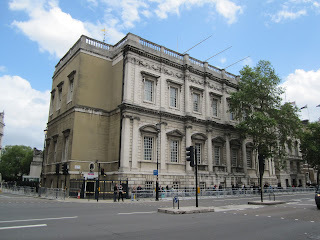 The Burlington school went even further in their puritan approach and made no secret of who was the idol of their ‘restoration.’ To the extent that this led the way to neo-classicism, the conclusion follows that the importance of Inigo Jones is even more important than what he is generally given credit for. The church of St Paul at Covent Garden goes much further than Palladio ever went in re-creating what was assumed to be ancient Roman design principles. Palladio recreated Roman models on paper, but what he actually built made no pretension of being anything but modern, despite the heavy use of column and porticos. Jones was the first to attempt to cross that line, the line into neo-classicism. He was also perhaps the first to think a classical portico, a Tuscan one in this case, would work on a church. In this he was using an order associated with an archaic form, perhaps in a deliberate way, to suggest that the reformed Anglican church embodied the primaeval and true teachings of Christ. That it is one of the first attempts at archeological re-creation was, therefore, potentially charged with a great deal of symbolism. With the groundbreaking work of Jones, Britain could move from the insular tradition inherited from the age of the Tudors to a style, which in the 18th century, French visitors found to be a pure copy of the Roman, or Italian as they labelled it. This criticism is not fair in all respects, but it did remain true that Britons had become the most enthusiastic followers of Roman classicism. By the turn to the 19th century, virtually all of Europe had followed a similar path, and flirted with Greek as well as Roman prototypes.